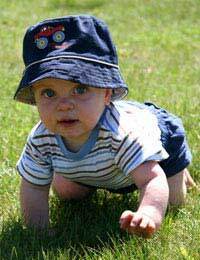 When babies learn to crawl it is a developmental milestone that many parents remember for years to come. Some parents view crawling as a bittersweet event – it is a proud time as they watch their child learn and grow but it can be heartbreaking to realise just how quickly their little baby is growing up. Many new parents have questions about babies and crawling and this is only natural. Below are some basic answers to frequently asked questions about babies and crawling. Crawling is often a baby’s first method of becoming mobile by his/herself. In order to crawl, babies first lift themselves onto their hands and knees. Many babies practice this over and over again, and cheering them on can be motivating for both parent and baby. When they have mastered this task, babies then begin to push back on their knees and move forwards and backwards either by moving the same hand and knew or by moving their opposite hands and knees (left hand and right knee, right hand and left knee move at the same time). What Do Babies Need to Learn in Order to Crawl? Babies must learn quite a few physical skills in order to learn to crawl, and they will do this by trial and error on their own. Before they will be able to crawl babies will need to be able to hold their heads up on their own, develop arm and leg muscles to keep their body weight up while they are lifting themselves onto their hands and knees as well as understand how to move opposite limbs at the same time. Learning these skills is natural for most babies, though having parental demonstrations will never hurt. When Do Babies Begin to Crawl? Every baby will crawl at a different age, so try not to become frustrated if your baby is not crawling when others of their age begin. Many babies will begin to crawl between six and ten months of age, though some babies never crawl and instead become mobile by rolling on their backs, scooting on their bums or simply pulling themselves up and beginning to walk on their own. If they have begun to crawl, many babies will master this skill by their first birthday and may begin walking sometime after this date. Babies will crawl if and when they are ready, but parents can make things more comfortable for them as they make their decisions. Clearing large spaces for mobility practice, keeping floors and carpets clean for the little ones and safe-guarding against sharp corners or other hazards will all help babies stay safe as they navigate with their new skills. Crawling is often a natural milestone on the way to walking and independent mobility, but not all children crawl and not all children who do crawl begin at the same age. Crawling is a highly individualised skill that your child will take advantage of as (s)he sees fit, which may not occur in a neat time chart. If you are worried about your child’s crawling or mobility, consult with your local GP or childcare expert. Otherwise, delight in your baby’s attempts and watch in fascination as (s)he enjoys learning more each and every day.